Have you eaten ample amount of ice cream and frozen treats this summer? Gosh, I hope so. I have made weekly trips to the Dairy Queen for a simple small twist cone dipped in chocolate or cherry, alternating from the week before. Sitting on one of eight picnic benches that lie beneath a rickety green aluminum awning, listening and watching children slurp ice cream and become distracted long enough for ice cream to fall on their shirts and knees and socks. Moms and grandparents swooping in with ample amounts of lecturing and napkins. A driving range lies just feet away at the far end of the parking lot, and the random whack of a golf ball breaks the constant drone of traffic. I have contemplated a bucket of balls just once. Sometimes I drive there on a Sunday afternoon with company, sometimes alone. And personally, I prefer the alone. Sitting, enjoying an ice cream cone, all by myself with no need to create conversation … time to zone out and think and just be. OK, I am just concentrating on eating the ice cream cone in a particular manner and I can do that much more successfully when I do not have to chit chat. But I do like sitting alone…legs stretched out on the bench of the picnic table, letting the flip flops dangle on my feet. Enjoying summer and taking a bit of a breather from the every day. I have been trying for years to figure out if I am a soft serve junkie or a hard scoop lover. Must one choose? I have never been to a ice cream hut or queen or king that offers both hard scoop and soft serve and if I did, my mind would explode and I would order twice the treats. A blizzard, tornado, or an el nino (depends on the local and what natural disaster is deemed suitable for naming a concoction where a candy bar is crushed into ice cream) and just two scoops of quadruple chocolate lovers dream coated with hot fudge or peanut butter sauce. All served with a sample spoon, forcing me to eat it slower and savor it longer. I was raised with two brothers – not only can I eat you under the table, I can do it twice as fast. At home – you can have the best of both worlds. I am here to let you in on this little secret and a glorious one it is. Ice cream straight from the maker is soft serve-ish and while I don’t have a machine to twist it ever so perfectly into a cone, it does make perfect milk shakes and natural disaster concoctions and is so perfect atop a warm brownie or slice of pie. If the leftover ice cream is scooped and packed into a freezer container and frozen for a few hours or over night – the result is hard scoop ice-cream that any Blue Bonnet -Ben and Jerry’s – Graeter’s eating crazed folk could appreciate. Myself included. It can withstand a good soaking in warm hot fudge or become a tower of scoops in a sugar cone. I am a firm believer in the 5 second rule. Peanut butter ice cream…not something you see every day. Sure a peanut butter swirl or bits and pieces claiming to be ‘peanut butter candy‘ are churned and stuffed into vanilla or chocolate ice cream is offered among every brand available. But simple, straight up, no frills, peanut butter? None that I could land my hands on and there are just some cravings you can’t shake, which always leads me into the kitchen and before long I am standing in front of the stove measuring and stirring and mixing. 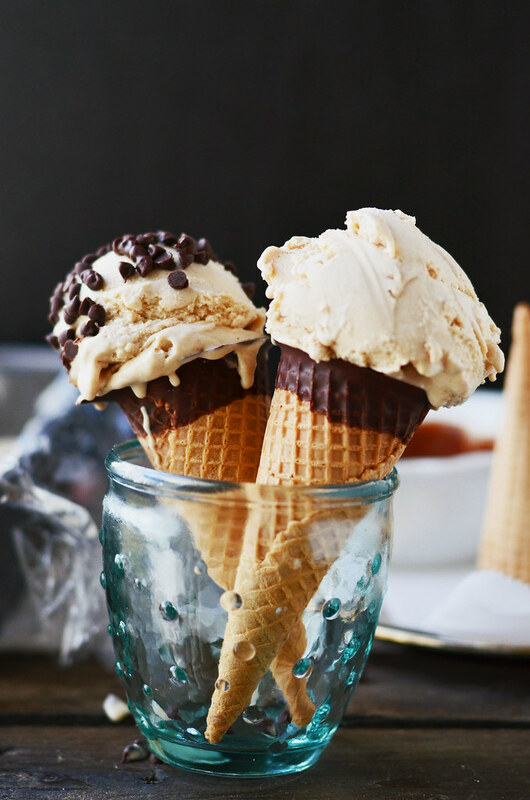 Peanut butter ice cream is for the peanut butter lover at heart. You must ask yourself this question…how do you like your peanut butter? If you prefer to eat it by the spoonful and wash it down with a glass of cold milk – then you need to head straight into the kitchen and hope to heavens you haven’t eaten the entire jar yet. If you only prefer peanut butter on a pb&j and the J>PB, then perhaps you should stick with the ice cream with just pb add-ins. It’s just a fair warning…because this is PEANUT BUTTER, like…whoa! 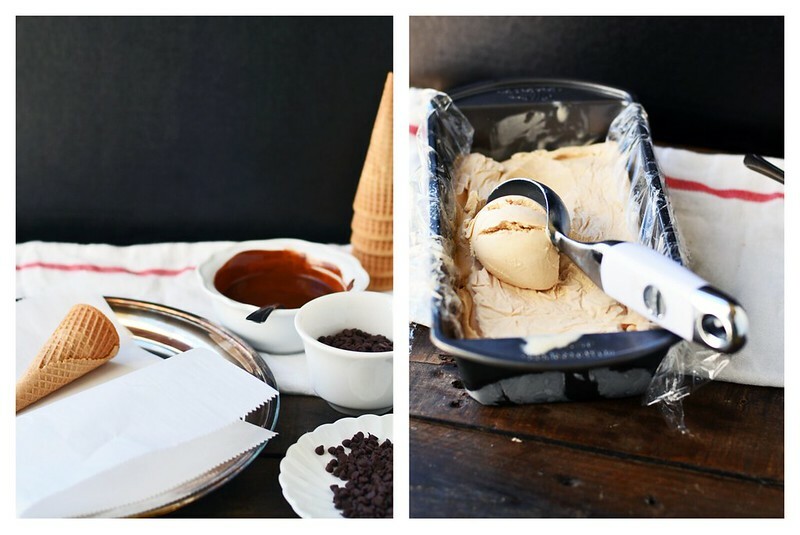 In a medium sauce pan, combine all ingredients for peanut butter ice cream. Place over medium low heat. Stir occasionally and bring mixture to a simmer until sugar is dissolved and the mixture is uniform. The peanut butter may not completely melt into the mixture but will be in tiny flecks - this is ok! Transfer to a container with a lid and place in refrigerator until completely chilled through - at least 6 to 8 hours or overnight. When ready to churn, give the mixture a good stir and pour into ice cream maker and churn according to manufactures instructions. 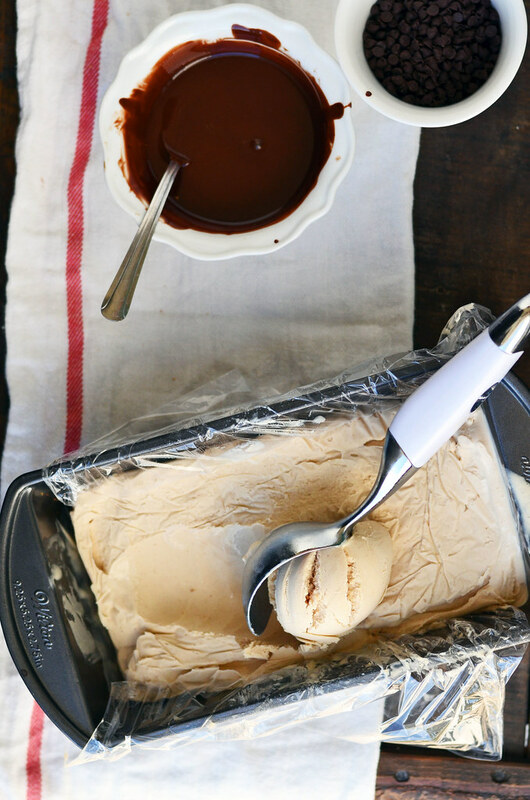 Once churned into ice cream, scoop ice cream into a parchment lined loaf pan or any container suitable for the freezer and freeze for several hours until firm. When ready to scoop, let sit on counter for a few minutes until scoopable. 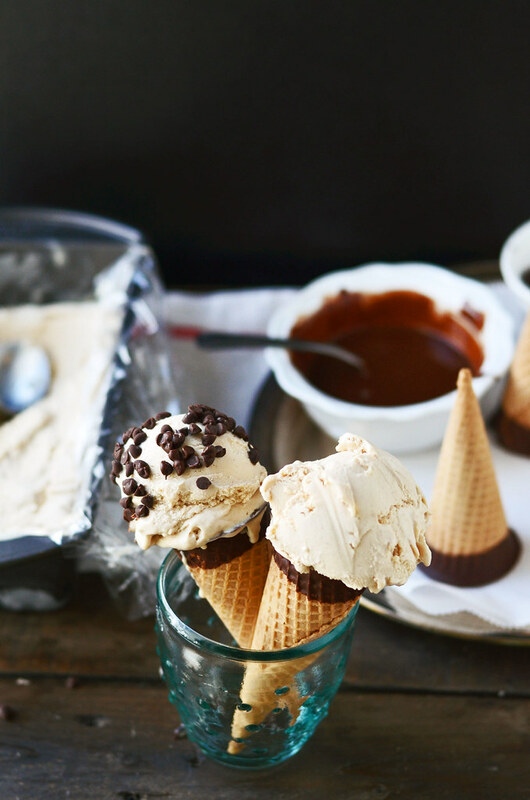 Serve in chocolate dipped ice cream cones - recipe to follow. Line a baking sheet with parchment paper. Set aside, but close by. In a microwave safe bowl, combine chocolate and coconut oil. In 30 second bouts - stirring between each burst, melt chocolate and coconut oil together until smooth. 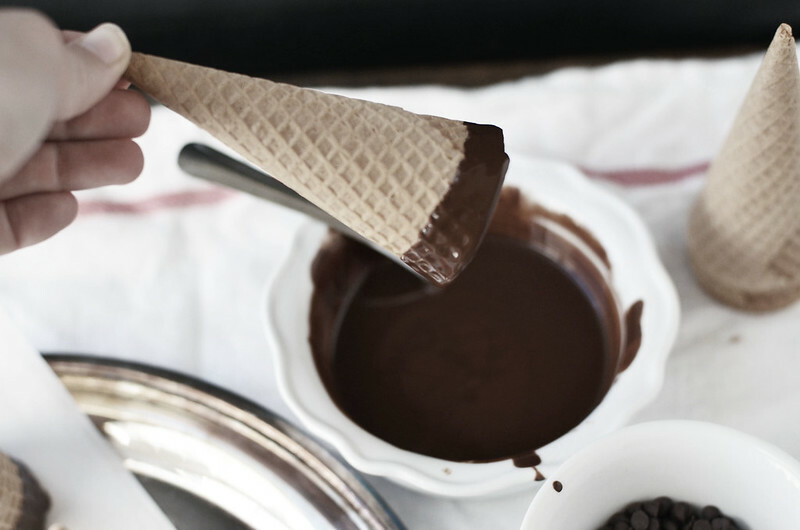 Working in batches of 3 or 4 cones at a time, dip the sugar cones into the chocolate and let some of the chocolate drip off. 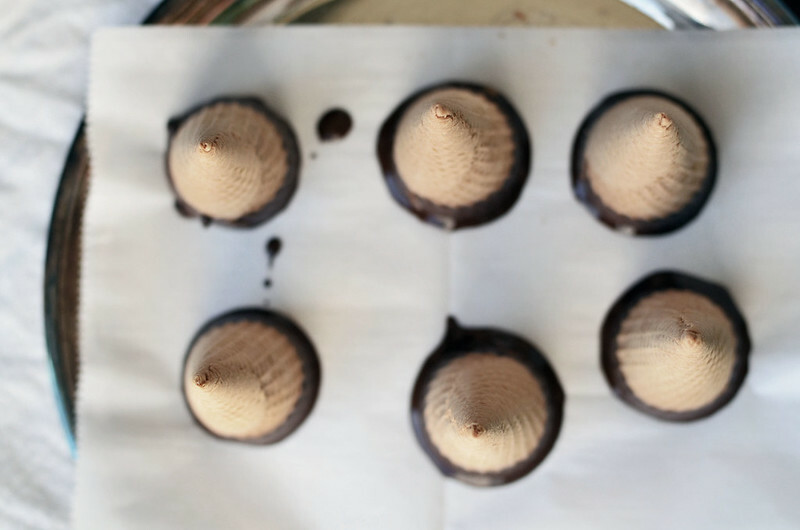 Place cones onto parchment paper lined baking sheet. 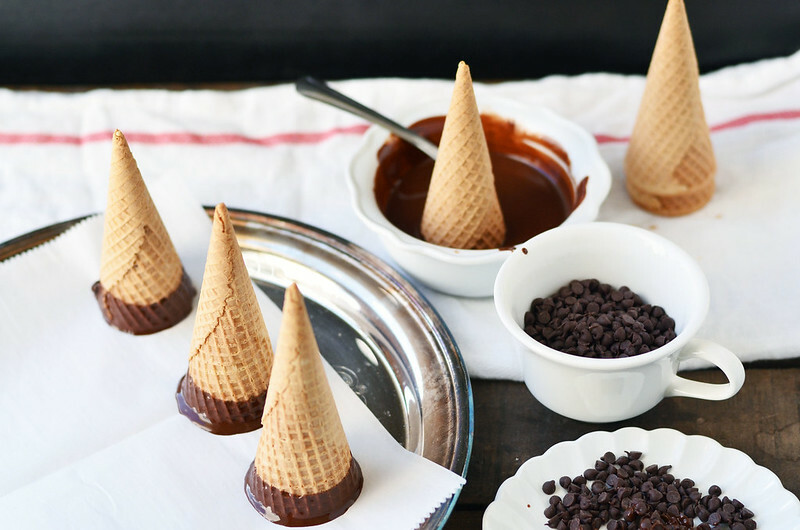 Once cones are dipped, place cones in freezer so the chocolate sets quickly. Do this several times until all cones have been dipped and then frozen. 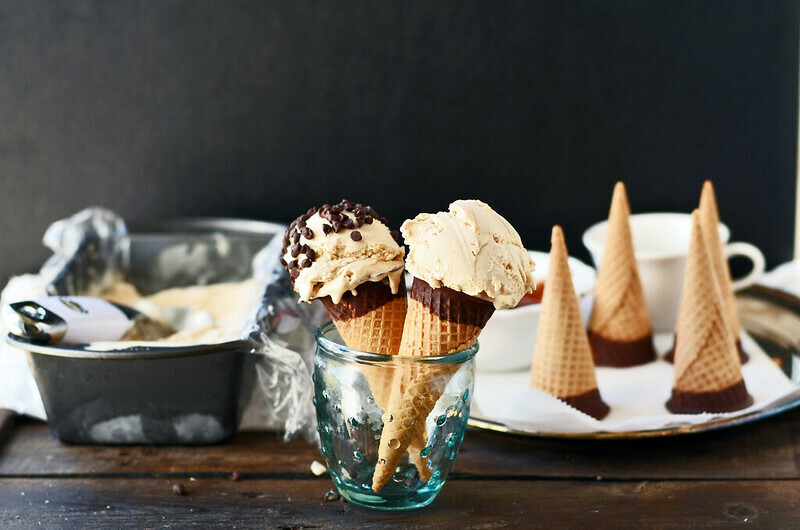 Fill cones with peanut butter ice cream and enjoy! 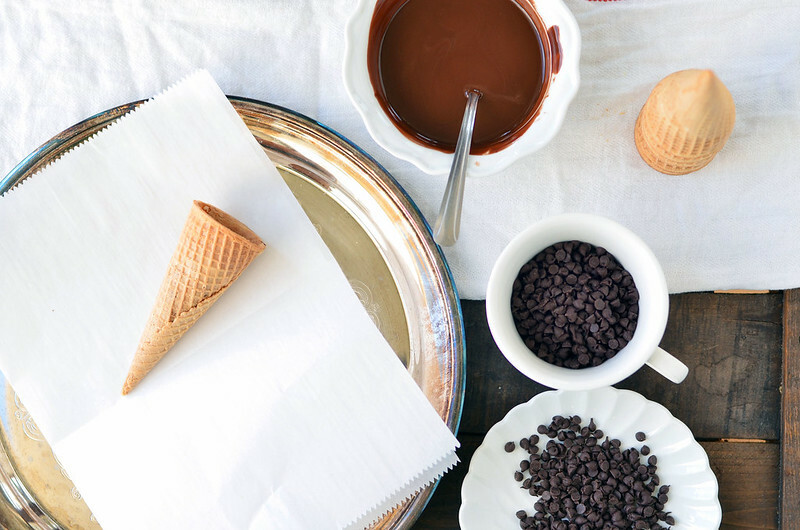 Cones - once chocolate is hardened - can be stored in an airtight container in freezer until ready to use.